Ox Ridge business manager Flavia Callari holds up a photo of the Ox Ridge Hunt Club in Darien from 1929. DARIEN — Chance Arakelian spent his entire 25-year career in the San Diego area, training, selling and importing horses. But when the opportunity arose for him to become a senior trainer and director of riding at Ox Ridge Riding and Racquet Club in December, he took the plunge and moved across the country for the chance to work at the legendary riding club. “I really liked everything they’re doing here,” Arakelian said. “I saw a lot of potential. There’s such a legacy here. It sort of just needed a breath of fresh air. “Anyone who’s done the sport has heard of Ox Ridge. It’s a big name in the industry,” he said. 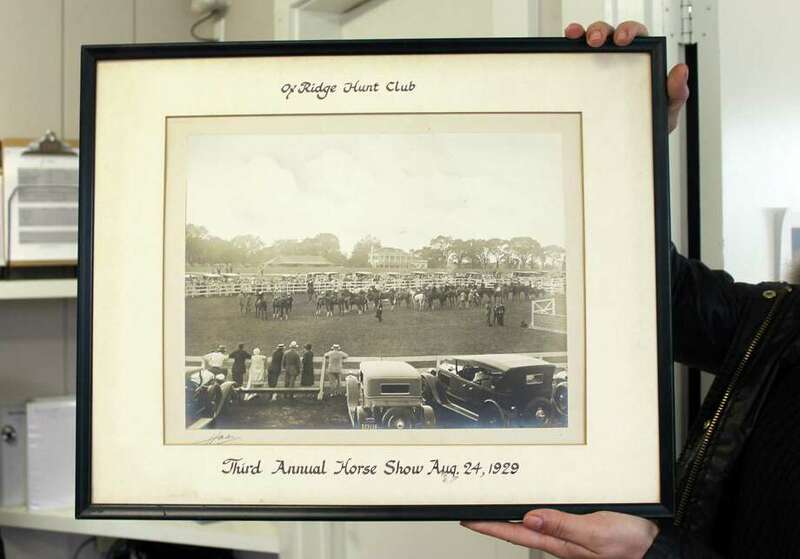 Since 1914, Ox Ridge has been a staple on the equestrian circuit and began hosting horse shows in 1929. George Morris, a “founding father” of hunt seat — forward seat — riding, got his start at the Darien club. Originally called the Ox Ridge Hunt Club, the Middlesex Road facility is in the process of reinventing itself, rebranding late last year as the Ox Ridge Riding and Racquet Club and selling off a 16-acre parcel to the town for $6.25 million. By this fall, Ox Ridge plans to have a new 18,000-square-foot clubhouse with eight squash courts, a fitness center and a pub for members. Callari said the club’s expansions will allow parents to pop by the gym for a yoga or Pilates class while their child is riding or practicing squash. The gyms will also be equipped with men’s and women’s locker rooms. For more information about Ox Ridge, visit oxridge.com. The addition of the six single and two doubles squash courts will make Ox Ridge a leader in squash facilities across Fairfield and Westchester counties, something Callari said is notable, considering the high ranking of Darien High School’s squash team. Even with the new changes, the club has no intention of letting go of its equestrian focus, and will expand its riding program and add a new indoor riding ring. Previously focused on competitive jumpers, Ox Ridge Riding and Racquet Club has opened up to other riding competition styles, as well as members interested in riding casually. Another goal is to add space and increase the number of horses it boards. The club now offers three options for members to have their horse serviced, trained or simply boarded at the Middlesex Road facility. Callari said they want to expand from the 30 horses they now board to 35 to 40 horses, most of them privately owned by members. According to Callari, the renovations began about a year ago and the club is about halfway through its remodel. The indoor riding rink will be completed around April, in time for its June show, which they’re hoping will attract some of the top riders around the world. In August, the club instituted its new riding program that allows people to get lessons for six months before having to pay for a membership. Arakelian said about half the people who start riding lessons go on to do shows, while half continue to ride for fun. “The biggest thing we’re trying to do is create that new rider and give them a place to start,” he said.